A great darkness has covered the land. An ancient prophesy reaches out from the grave, “The Sun is dead, and the moon fears his name!” In this gothic horror story, you are the Champion, the tragic hero, sent by the high council to stop an undead creature from taking all breath from the world. When a shadow, as black and cold as death itself falls upon the face of humanity, the actions of a brave defender are required. You are that guardian, the last best advocate of light to oppose the absence of all light and life. 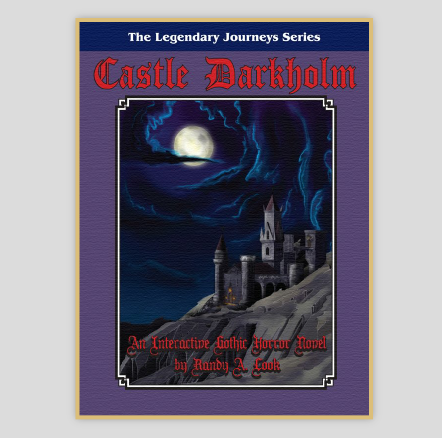 Darkholm combines classic elements of both Text Adventure games and Choose Your Own Adventure books to provide a truly interactive quest that will engage, frighten and entertain you. Castle Darkholm unleashes some of the very best features of the adventure game genera and brings them to the world of ePubs. Collect, discard, and use the numerous items discovered throughout the Darkholm realm in your efforts to end the world’s suffering; your inventiveness with a shifting inventory of objects is one of the keys to your success. This is a gamebook where your actions as well as your ability to solve mysteries through deduction are the crucial to your survival. Darkholm provides you with an extensive location oriented environment that you journey within encountering mysteries, puzzles, and inhabitants that all require you to carefully observe, interact and think your way through. This is a work of modern interactive fiction designed for today’s eReaders and tablets. Content Advisory: This is a gothic horror story and contains examples of blood, gore and intense violence and may not be suitable for some readers. While you are the hero, you will encounter the darker elements of humanity’s fears. Parental guidance for younger readers is encouraged.